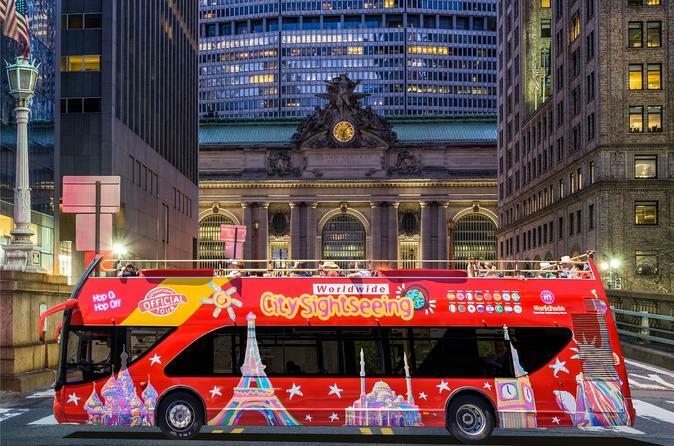 A great value for those short on time, this New York City Hop-on Hop-off Day Tour will allow you to maximize your time with unlimited hop-on, hop-off access from 8:00am-6:00pm. The tour combines the Downtown and Uptown Loop for either 1, 2 or 3-days. Pick and choose your must see itinerary with over 40+ hop-on, hop-off stops throughout Manhattan. Add on an attraction to upgrade your experience. Take your pick between 1, 2 or 3-days. In addition to live tour guides in English you can choose pre-recorded narration in English, French, Spanish, German, Italian, Portuguese, Mandarin, Russian, Japanese, Korean or Hebrew. The narration is enhanced with music and sounds of the bustling New York city streets. Additionally, it is GPS-triggered so what you hear will always be relevant to what you see. See the world-famous Times Square, where bright lights and billboards set the scene for your one-of-a-kind adventure. Let our professional, well-versed tour guides take you on a journey through other well-known Manhattan neighborhoods, like Greenwich Village, SoHo, the Financial District, Chinatown and the Lower East Side. Sit back and relax as you enjoy double-decker views of famous sights like the Empire State Building, the Flatiron Building, Rockefeller Center, Madison Square Garden, the Statue of Liberty, Central Park, Fifth Avenue, Lincoln Center, American Museum of Natural History, Cathedral of St. John the Divine, Grant's Tomb, Apollo Theater, Harlem Market, The Museum Mile, Guggenheim, the Metropolitan Museum and many more! You'll have unlimited access from 8:00am-6:00pm. Upgrade to add an attraction from the list below. Special Offer - Book by August 31 to save 35% off our previously offered price on the Uptown Downtown Loops Day Tour! - Book Now!